Up early, as usual, but even more so today. 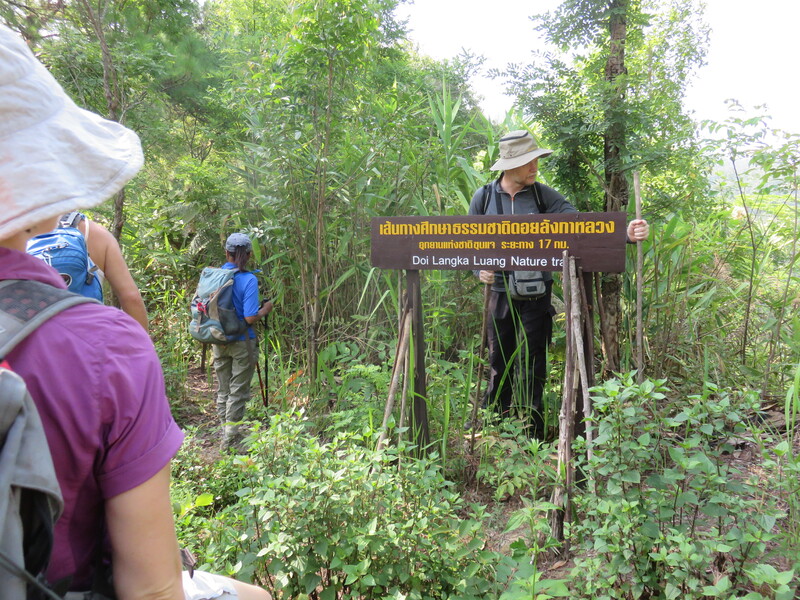 We’re going trekking on an exploration hike with the hiking group here in Chiang Mai. The Royal Ploughing Ceremony is an ancient royal rite held in many Asian countries to mark the traditional beginning of the rice growing season. It’s a public holiday for the higher educations like universities, but not for the kids in middle school. In the ceremony, two sacred oxen are hitched to a wooden plough and they plough a furrow in some ceremonial ground, while rice seed is sown by court Brahmins. Brahmins are the top of the four casts in the Hindu society consisting of priests, teachers and preachers. After the ploughing, the oxen are offered plates of food, including rice, corn, green beans, sesame, fresh-cut grass, water and rice whisky. Thanks to wikipedia for the background. To get to the meeting point we have to drive the motorbike for almost an hour. It’s ok, but you feel pretty little and vulnerable on the highway on a 125 cc scooter. I call it a motorbike, but when you sit with your knees touching each other the balance is not as good as with a wider base and the engine is just enough to take us around. We meet the group at the designated meeting point and there are a few faces from Sunday. We’re introduced to Mike that lead today’s trek and Peter that will act as a co-pilot. After a little delay we move out and head towards the starting point. We’re on a exploration hike to see if it’s passable as a route for Sunday’s hike. This means there are certain uncertainties connected to the hike. Is there a trail leading over the ridge? Is it accessible? We park one car where we believe we’ll come down and drive the other two up to Doi Radar (or Doi San Yao, which is the real name). Doi means mountain and Radar is just that, a radar on top of the mountain. So the “name” Doi Radar gives good meaning actually. The road up Doi Radar is narrow and steep. Very narrow and very steep actually, but we get up, park and get ready to hike. Mike explains that we start out on the beginning of what’s called The Rollercoaster Trail. As you can imagine this goes up and down over the peaks. The goal is to see if we can connect this trek to another ridge. Then follow that ridge all the way down to the first parked car. We’re eleven hikers ranging from 22 to 77 years of age. I didn’t know it at the time, but learned that fact during the hike. I look at Janet who’s clearly a woman who has been around for some time, before we start and, shamefully I must admit, think she’s gonna have a hard time today. Good thing my mommy taught me to shut up about such stupid thoughts. Janet got her walking sticks in her hand and set off. As I walked directly behind her in a climb I looked at her calves as they where in the height of my eyes. A lot of “grown ups” tend to lose muscle mass and have arms and legs flapping with loose skin formally filled with muscle. Not so with Janet. Her calves are rock hard and you can see the muscles working when she’s working her way uphill. I’m utterly impressed that you can have such stamina and power at the age of 77. An inspiration to both Katja and me. This is why we train, go hiking and stay active; a healthy life in old age. As Janet said: “Here inn Thailand they say age is just a number.” A good mental focus. She did climb Kilimanjaro last year, just as another description to her hiking abilities. We kept going up and down and found a trail most of the way. We stopped for a little snack on a top with a beautiful view, then later had lunch at another peak. Now it started to get interesting. No more trail. We could see the ridge we wanted to follow towards the car, but there were no trails connecting them. Trails here in Asia are different from the one in Europe. Where we tend to do trekking as a social activity the trails here are used for practical purposes. Get from A to B with a load to carry, use shortest route. Even if it’s straight up. So where the European trail often snake its way up a hill or mountain, here they go straight up. Poachers wanting the higher grounds are a common reason for the trails to exists in the first place. And I mentioned on our last hike that there are no animals here. It’s almost no birds either, or squirrel, or monkeys. If it can be eaten it’s been hunted down by people. Projects for reinstating animals have failed because they immediately get hunted and eaten. So vast areas are more or less empty except for bugs. During one of the breaks where three different people were out looking for trails the conversation turned towards snakes. Cobras love bamboo. On several hikes they have spotted snakes of different sizes and this was vividly decribed. For us coming from a country with only one poisonous snake, that really isn’t all that poisonous, this was a bit weird. “We walked and the cobra was laying on the bamboo just above us…” Ok, what’s next you say? Going down there in the canyon that’s filled with bamboo? Right…. As the snake stories aren’t enough to keep your alert it’s always the leeches to take into account. We got out clean though. No snakes, that we saw, and no leeches needed to be picked off neither of us. On our way down into the canyon I think everyone fell at one point or another. The ground was covered with dead leaves and pine needles. This makes for excellent slides. Well down in the canyon we found one way closed off by a tangle of fallen bamboo. Over the next ridge or around the other way? Peter looked at Katja and me as we three at this point made up pointmen. Peter went up on the next ridge while we waited down for the rest. We decided on going around and climbed, crawled and walked towards the sun. That was a good sign as the highway goes north south and we were heading due west towards it. We passed what seemed to be evidence of illegal logging in the bushes, and coffee plantation that seemed to have been neglected for some time. Then we saw the power lines. Fist pumping and smiles. We’ve been trekking for six hours and forty minutes, not including lunch since we set out. The trek started at nine fifteen from Doi Radar, now it’s four fifteen, seven hours later. We didn’t find the car there. We’re seven hundred and fifty meters down the road from it. Janet, Peter and Karel walked off to pick up the first car, drive up Doi Radar to fetch the other two. The rest of us waited in the shadows with a nice little lady that sold water and orchids. We used her house to wash off some of the sweat and we all emptied our shoes and attended blisters and sore feet. There’s another forty minutes into town where we pick up the bike. In the car we get several good Chiang Mai tips from Mike and Peter that’s been living here for a long time. We say goodbye to the guys and drive off on the hour long ride back. We do a pit stop at a little market and buy fruit and water before doing the last stretch. It gets dark and the bugs come out. Driving in total darkness with only the light of the bike is a little like driving in Norway in winter. Do you know the feeling when it’s pitch black and snowing the biggest snow flakes ever? When you turn on the long distance lights it looks a little like warp speed from star wars or star trek. It’s like that, but here it’s not soft snow flakes it’s bugs. Some off them are so big it hurts like hell when they slam into your face. Not to mention the once that don’t die on impact but continue to kick their legs while stuck at the brim of the helmet or in my beard. My tolerance for bugs is off the chart now compared to when I left home. We grab dinner at our local little restaurant and enjoy close contact with more bugs there. One is especially cool, a firefly. It slowly descend on our table while flickering light at the end of its body. A cool little thing. We’re back home at eight, thirteen and a half hour after we left this morning. We bought two beers at the little market that we enjoy while laying naked on the bed. The air condition did not work when we came back and the room holds about thirty degrees. They fixed it before we fell asleep, and I’m glad they did. It would have been a sweaty night if they didn’t. One beer = Goodnight Irene!